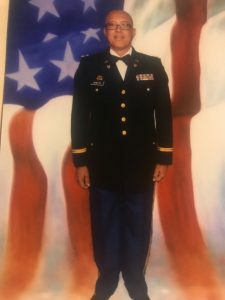 Fernando R. Webster Sr., Major, USA, Ret, Senior Army Instructor, is making a difference with students at St. Croix Central High School Junior Reserve Officer’s Training Corps (JROTC). Webster, who lives on St. Croix, joined Central in 2005, when the position became available. Since that, time he has made the JROTC cadets a highly visible group, though he shies from taking any credit, and quotes an often used phrase, “It takes a village to raise a child.” Webster is assisted by CSM Dubose, and together they are making significant differences in the lives of the students that go through their program. The community service projects run the gamut, eating into free time, holidays and weekends, as the students work as escorts during pageants, guide traffic and parking, participate in various military parades, roadside and beach clean-up, and perform color guard duty at many functions requested by the community. Webster’s and CSM Dubose’s regular work day is not over until 7:30 to 8:00 PM, when team practices begin. After practice, they provide transportation for members of the team. The JROTC cadets are like our children, says Webster, who is married to the former Luz Belardo and has four adult children. Depending on the event we participate in, the host may feed the cadets. Other times Webster or CSM Dubose may buy them pizza or stop at one of the fast food restaurants prior to taking them home. “We always have a need for donations, although we would prefer doing fund raising.” As a result of the numerous hours of community service they perform, there is little time for fund raising. There is not a week they don’t get a request for their cadets to participate in a community service activity, and they have never refused. The JROTC curriculum offers students training in financial management, etiquette, health, nutrition, first aid, conflict resolution and management and many other life skill classes. The JROTC curriculum incorporates some basics – things they need to survive in the real world. Webster, who spent 24 years in the military, has 14 years as a JROTC instructor. We so appreciate their service, and know that Nando is making a difference in these cadets’ lives here in St. Croix. If you’d like to support his efforts (SCIL made a contribution to help them buy new drums for their Drum Corps), email me and I’ll get you in touch.